This Chapter summarizes our current understanding of Saturn's magnetospheric configuration. Observations from the Cassini Prime and Equinox Missions have answered some questions and opened new ones. One of the fundamental questions of magnetospheric physics is what are the sources of the plasma that populate the magnetosphere. At Saturn, there is a rich set of possible plasma sources: the solar wind, Saturn's ionosphere, Titan, the rings, and the icy satellites. One of the most significant discoveries of the Cassini mission was Enceladus' role as a source. Saturn's magnetospheric convection pattern falls somewhere between that of Earth and Jupiter. Earth is a slow rotator with a relatively small internal mass source and its magnetosphere is primarily dominated by the solar wind. At Jupiter the solar wind only plays a minor role since Jupiter is a fast rotator with a strong surface magnetic field and a significant plasma source (Io) deep inside the magnetosphere. As a consequence, internal processes dominate the magnetosphere and solar wind interaction is only marginally important. Saturn falls somewhere between Earth and Jupiter thus Saturn's magnetosphere exhibits both solar wind and internal controls at the same time. This fact makes the Kronian magnetosphere even more fascinating and complex than the magnetospheres of Earth and Jupiter. 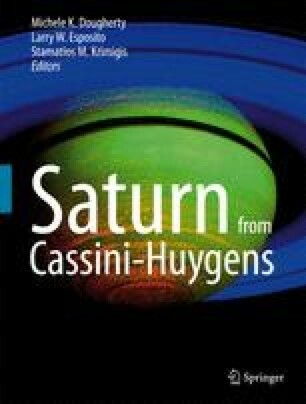 This work was sponsored by the international Cassini/Huygens Project. Authors were supported by NASA under the following contracts: JPL-1279089 (TIG), JPL-1279973 (AMP) and NASA NNX07AE74G (KKK). Work at JHU/APL (SMK) was supported by NASA under contract NAS5-97271 and NNX07AJ69G and by subcontracts at the University of Maryland and the Office for Space Research and Technology of the Academy of Athens while work at Fundamental Technologies (TPA) was supported by APL subcontract 946749. Work at Los Alamos National Laboratory was conducted under the auspices of the U.S. Department of Energy, with support from NASA grant W-19289. CSA was supported by the STFC rolling grant to MSSL-UCL. NK was supported by the German Bundesministerium für Bildung und Forschung through the Deutsches Zentrum für Luft-und Raumfahrt e.V. under contracts No. 50 OH 0801 and 50 OH 0802, and by the Max Planck Gesellschaft. The authors are indebted to Fran Bagenal for her valuable comments and suggestions.